I’ve written before about the language difference and communication issues as a Trini living in Guyana, even though the two countries are so close and share alot of common history. That was a difference of fast food lingo, but today I tried to give instructions over the phone, to essentially make bake. And I don’t know if the Guyanese know about bake. I mean here, bake bake* of course, as opposed to fry bake (which my grandmother used to call “fry roti” since it was essentially fried sada roti), or even tawah-bake (a rarer creature and not the same as sada roti). But to start from the beginning. Due to my schedule, I have some weekly help at home and I very recently worked out an arrangement where she’d make some bread for me from time to time. The bread you buy here is sooo sweet and soft and I can only manage to bake bread on weekends. And lately, I’ve been on the road and in the air on weekends. Knowing that I do cook, and having seen my mother at work in the kitchen, my helper knows that we care about the food we make and eat, and that we don’t necessarily make things the way she would. So she made to sure to find out how much salt, sugar etc I wanted in the bread and the first time was pretty good. However, today I get a call from home. She’s mixed the flour with a bit of shortening, the sesame seeds I left on the counter, whole wheat flour etc and then realised there was no yeast…I’d forgotten to stock up. (Another reason I can’t always manage to bake on my limited free time…) No problem though – I have baking powder. So I tell her, ok use some more shortening, add some milk, and mix it somewhat “soft”. The problem came when I started to explain how to bake it. Because I wanted to turn it into bake. Bake bake. But she didn’t quite get it. I tried explaining that it shouldn’t be rolled up like a bread loaf, but flatter. Not rounded, but flat, like a flat bread. And then while I was trying to describe bake over the phone, I realised I’d never seen a bake in Guyana. Fried bakes sure – they make those here, often a bit softer and sweeter than my taste, but it’s here. But not a bake like coconut bake (or for that matter saltfish bake, as my mother will probably comment). In the end I asked her to knead it and put it in the fridge. While I was waiting for it to bake this evening, I continued reading through the impressive and gorgeous piece of work that is Cynthia Nelson‘s book, Tastes Like Home. And it confirmed my suspicions – there is no bake bake in Guyana. Ahhhh.Of course, I could probably have done a better job of explaining, but there are some things you never think you’d need to explain. Plus, I was in the middle of explaining legal stuff and writing opinions and apparently I couldn’t switch gears into food talk. * I could call it “roast bake” but I never grew up with that term, plus “bake bake” is so much more fun! This entry was written by Chennette and posted on February 8, 2011 at 10:48 pm and filed under food, Guyana, Trinidad and Tobago. Bookmark the permalink. Follow any comments here with the RSS feed for this post. Post a comment or leave a trackback: Trackback URL. the language is confusing to the uninitiated. To the world’s population minus 1.3 million – exactly what is ‘bake’ not exactly a dish but a method of cooking. Then there is fried bake… language is indeed complicated. Bake Bake… yuh know although I understand the adjective and the noun, I can’t help but smile… we have fry bake, roast bake and bake bake… certainly the english language was not made for Trinis! Maggie, TB – Trinis make full use of our language but I wouldn’t call it English. We more advanced than that! TB – believe it or not, it was from you I first heard about tawah bake long long time ago, but true! Mom – with the extra sesame seeds it made up for not having coconut so i still enjoying my bake bake. Very weird that there’s no roast bake in Guyana. And I’ve never heard the term bake bake before – can’t wait to try it on my mother! Lol….I also grew up with the name plateen but it was used by our non Indian neighbours. However tawaah remained the name we called it by in our home. Thanks for bringing back memories………….as I am remembering my neighbours from north Trinidad who made nice cassava and coconut bakes on the plateen…. I think that you should indeed demonstrate coconut bake and hops. It is the ambassadorial thing to do. Let me know when and where. I was trying to make Kubbat an Iraqi dish that someone showed me a few years ago and found your blog and think its interesting. I haven’t been to Trinidad or Guyana, but did take my tent to St. John in the US Virgin Islands for some solo camping on a beach and would love to explore more of the Caribbean. I’m from Albuquerque, New Mexico USA and am currently living on a cattle ranch in Canada. I have several blogs myself, but am too busy to keep them up these days. I don’t know what “bake-bake” or “fry bake” is. I just bake in the oven. 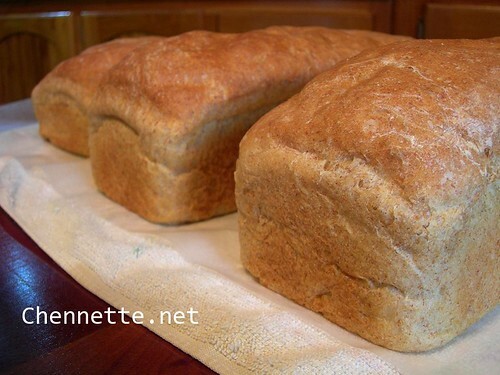 Yesterday I made some amazing bread that I added molasses, creamed corn, and corn meal to the wheat and yeast (no water). It made a great sandwhich and was so easy. Up here in Canada when its hot out in the summer people use their outside Ukrainian ovens made from bricks to bake. I must be one strange Guyanese because I bake bake in the oven and I have since I wsa very young. I never put coconut in it but as far as i am concerned you can put whatever you want in the dough. Even sausage cut into bits. Herbs or spices, anything. And I eat it with anything – bhaigan. pumpkin, cheese, butter, bhaji, fried fish – whatever. I also make pot bakes and bakes on the tawah and fried bakes. I am one of Cynthia’s anonymous avid followers. ABQ Annie, I would love to know how to make such and oven as I want to build and oven in my backyard….. I only just recently here that term “roast bake” and I was utterly confused. I think I started imagining bake, burn black or something.